Many cats need a good amount of stimulation in order to keep them from becoming board, and we all know what a board cat is capable of! 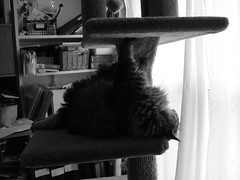 Cat trees provide that type of stimulation. Most people wonder what to look for in a cat tree. As a cat tree manufacturer and a cat breeder, I would like to point out what is important to me. All cat breeders know what mischief our cats are capable of. If there’s danger in your house, your cats are going to find it. Not only is the cat tree manufacturer responsible for making a well built, safe cat tree but the cat owner is responsible for using good judgement in the selection and use of it..